This is a comprehensive horse training agreement that includes provision for livery and the option of rider training. Although drawn for professional trainers who are likely to offer remedial training, lessons to the owner and competition experience, it could also be used by someone breaking a friend's horse as a one-off favour. 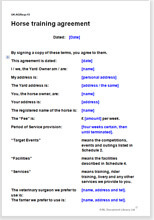 Using this agreement should help prevent disputes arising as a result of mismatched or unreasonable expectations as to the service offered. Many horsemen simply agree to a training deal casually under the proposition that the owner will turn up from time to time for lessons on her ever-improving horse. It is easily done. But that leaves you open to numerous potential problems. Without the terms of training written down, it is likely that at some point you will disagree with your client about exactly what level of service you are providing and what they should reasonably expect from you. Training lessons for the owner. Other miscellaneous matters to protect your interest.